Savor a taste of a rich culinary tradition with this DIY tamale kit. Upon listening to her college roommate recount her family's process of tamale-making that has been passed down through the generations, foodie designer Carley Sheehy created a DIY recipe kit that allows even the novice to roll up their sleeves and throw their own tamalada. In Mexico and many South American countries, tamales represent a holiday tradition that combines family and food into an all-day cooking marathon that ends in unwrapping some delicious "presents." Master the time-honored techniques with Carley's step-by-step instructions: make the masa, add your favorite fillings, wrap in corn husks, and steam. Once cooked, open and drape them in a piquant, three-pepper sauce of ancho, pasilla, and New Mexico chilies, and savor a taste of a rich culinary tradition. Starter kit makes about 16 tamales. Assembled in Livermore, California. Click here for vegetarian recipes using your DIY Tamale Kit. Makes 16 tamales. Serves four. This item is manufactured in a shared facility where all popular allergens may be processed. Contents of this kit are gluten free.. If I could get the recipes so I could make again I would really appreciate it. I wish I had at least saved the instructions. So good, of course I want to repeat. Can't wait to make homemade tamales! 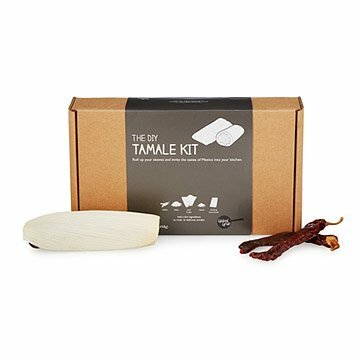 Cute gift for anyone who loves cooking or tamales! Perfect gift for the chef in your life! We cooked the tamales together and it was so much fun. Great couples night! My husband and I had a lot of fun making these tamales. The instructions are easy to follow and lead to your learning the technique of tamale making. The result of our hard work was some of the most delicious tamales we've ever had. Very happy with this purchase! It is unusual and very fun, plus practical. She has not opened it yet, it is a Christmas present. Everything was perfectly packaged and ready to go. Gave as a gift, in-laws loved it! I bought this for my friend as a birthday gift since we are such foodies. I was so intrigued by all the contents so i had her send me a inside the box video and it was pretty awesome! I am totally getting one for myself.